Every one loves the idea of throwing a delightful and chic dinner party. A successful party will lead to days of praise and a huge ego boost. Well, it does for me! Dinner parties can also be very stressful and the hostess becomes rather worn out by the time the guests arrive. The key to having an easy breezy, stress-less party is to have simple yet sophisticated scrumptious food. 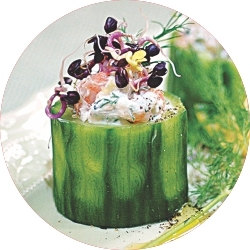 Serve some appetisers when the guests arrive to have with the drinks. This will also give you time to finish or heat up your main dishes. If you are pressed for time and want to focus on your main dish there is a solution. There is a wide variety of cheese available now in the supermarkets. Set up a plate of three or four types of cheese along with some crackers, sliced crusty bread like baguette and a bunch of grapes for the guests to help themselves while they mingle. Remember don't stress yourself out, have a good time! If you're comfortable and happy, your guests will feel welcome. These are tasty and super easy to make. Preheat oven to 400 degrees. Lightly oil a rimmed baking sheet. In a food processor, pulse bread and garlic until fine crumbs form; set ½ cup aside. To food processor, add cheese, parsley, and red-pepper flakes. Season with salt, and pulse filling until combined. Gently remove the stems of the mushroom. 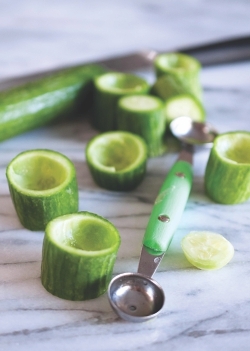 You do this by taking the tip of your knife and lightly pushing the root of the stem. You can just pull it off. Spoon the filling into each mushroom, and roll filled side in reserved breadcrumbs. 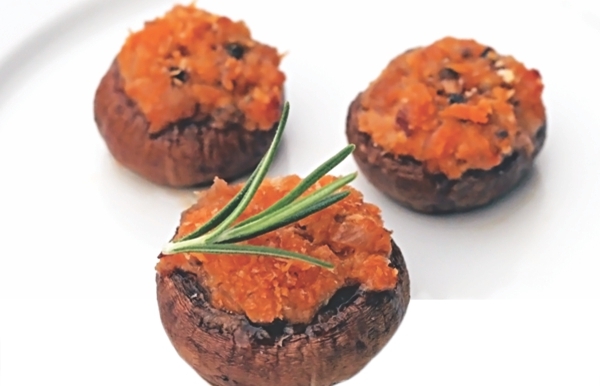 Place on prepared baking sheet; bake until mushrooms are tender and lightly browned, 15 to 20 minutes. If you want to give it a 'deshi' twist, lightly sprinkle some 'garam masala' powder on it. You can find fuchka shells in supermarkets and you don't always have to make the traditional filling. This will be a very interesting twist to the regular 'fuchka' and very delicious. In a pan heat some oil and fry the diced pineapple until lightly cooked. This should take no more than 2 minutes. Keep aside. Mix the shrimp, paprika, salt, garlic paste in a bowl. In a pan heat some oil and place the shrimp in the pan. Cook the shrimp till they turn opaque, 2-3 minutes. Take it off the heat. Mix the chopped spring onions and pineapple with the cooked shrimp. Take the 'fuchka' shells and lightly make a hole with your thumb and place a spoonful of the mixture in the shells and serve. Both the mains can be served with steamed rice or bread of your choice. Heat oil in a large pot over medium heat until hot but not smoking. Add onions and cook 5-7 minutes until softened and starting to brown. Add garlic and ginger and stir for 20 seconds. Add dry spices and stir for 20 seconds. Add chopped tomatoes and chicken thighs. Stir for 5 minutes to cook spices and flavour the chicken. Add coconut milk and chopped green chillies. Stir to mix. Bring to a boil, then lower heat, cover, and simmer 30-35 minutes, until chicken is cooked through. Let chicken sit for a few minutes. Excess fat will rise to the surface and you can skim some of it off with a spoon. Arrange fish in a single layer in a shallow roasting pan coated with oil. Combine orange juice and next 9 ingredients. Pour over fish. Let stand 15 minutes. Preheat oven. Sprinkle fish with paprika and over the fish and cover the dish with aluminum foil. Bake at 180 degrees for 35 minutes. In a large pitcher or punch bowl, combine juice, cut fruit and vanilla extract. Cover and let chill for at least 2 hours. Remove from refrigerator. Add in sparkling apple cider or apple juice. Serve in wine glasses or tall glasses with plenty of ice and fruit for garnish. In a big bowl combine the water, Strawberry Foster Clarks, lemon juice, 'malta' and sugar. Put the Mint leaves in a tea towel and crush them. Add them to the other ingredients. Put it in the fridge. Dice the strawberries and add them to the individual glass along with ice before serving. Blend ingredients with ice until smooth. Place in a glass and top with ginger ale. Exclusive party collections are something that we don't get to find often in local boutiques. Getting that perfect fit and cut that suits your shape and taste is really hard to find. But Anokhi is here to change the trend. They have brought out a new collection of trendy party wear in edgy cuts, colours and designs to make fashion lovers swoon at the very first sight. Humaira Khan has been running Anokhi for the last 24 years. Its success lies in its niche offerings to the highly loyal customer base it has developed for over two decades, who bestow their full trust in the designs created by Humaira. Anokhi started as an endeavour to fuel her personal interest of designing, catering to a very niche premium segment -- the reason it never took a commercial look. Her theme was always to keep her designs young, chic, understated and elegant. But now after so many successful years of existence, she wants to give it a more professional look, something that will be a comprehensive solution for her existing base of loyal clients. Anokhi's couture and prêt-a-porter lines are produced in limited quantities and are constantly evolving to discover new heights of style and creativity. Their strength covers all aspects from trendy 'pret' to luxury collections. Every season, Anokhi brings in new collections for its clients to bring freshness in styles and cuts and with the festive season upon us, Anokhi offers you an exclusive range of collections with attractive necklines, trendy patterns and one of a kind embellishment. Their party wear collection makes use of of chiffon, net, crepes, georgette, silk and velvets. The pieces are adorned with accessories and embellishments of 'karchupi' work, beads, 'zardozi' and 'zari' ribbons. This season, they have focused on deep colours like black, red, green, purple and blues that give the pieces a majestic look. Wraps and chic asymmetrical patterns are to be seen the most in their collection this winter. Long kameezes are definitely dominating the list with long, flowing kurtas and saris in the roll too. The boutique is not only playing a vital role in the fashion sector as a leading boutique for ladies but has successfully established its own style, pattern and richness and has continually made fashion statements over the years. Today's generation is very stylish and trendy and that is where Anokhi comes in with its exclusive designs, materials and cuts. Everyone will find something interesting here to suit their taste -- be it kurtas, fatuas, shirts, kameezes, suits, saris, etc. There is always something in the offing to meet the daily needs for casual wear and even to look gorgeous on special occasions. Anokhi is a prestigious name and has its own brand value in the fashion industry. The colours, cuts, necklines, designs and fittings of their creations are exclusive and preferred by many. The boutique have been doing the job of satisfying their niche customer base with their couture collections, but are also handling their mass customer base very efficiently with their evolving collections.